Superb Condition, LESS THAN 5,000 MILES, PRICED TO MOVE $900 below Kelley Blue Book! Perfect for a family! As experts point out this Ford Edge is One of the top choices for a midsize crossover SUV. Previous owner gently used this Edge and took care of it. With its powerful engine and high quality and attractive cabin, you family will surely appreciate their New ride. Abundance of high tech features on board will make those long boring family trip more enjoyable. Stop dreaming about a perfect family ride and give us a call to test drive this Edge and make your dream come true. 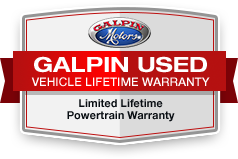 During your visit please don't forget to ask us about 'Galpin Used Car Difference'. All figures are EPA estimates. Actual mileage will vary. Kelly Blue Book values are calculated based on the current Retail Book. Pricing analysis performed on 3/8/2019. Fuel economy calculations based on original manufacturer data for trim engine configuration.